Tipping in New York isn’t so much discretionary as it is a yardstick by which your soul is measured. And that’s not entirely unreasonable -- most people in the service industry in New York depend on your tips so they can, you know, live. But the line between appropriate tip and shame on your entire family is thin. So just to make sure we’re all on the same page, we talked to a combination of experts, including people in the industries, the New York tourism board, and an expert on New York etiquette to pull together the official New York tipping guide. New York City’s tourism board, NYC & Company, agrees that 15-20% of your total fare is entirely acceptable. Fitzpatrick, however, believes you should swing a little more generous. “Depending on the size of the building, how much they do for you, how much they do for the building, etc, the standard would be $100-$250. If it’s your first year there, you might give them a little less than that,” she says. Seamless makes it super easy to add a tip -- all you have to do is click a simple button when you’re checking out, so you don’t have to be bothered with fast math at the door. As with most of the service industry scene in New York, 20% is pretty much the standard for tips. You might consider giving a little extra if you’re making those delivery guys trek out in things like rain or, you know, those pesky blizzards. “Again, this depends on the size of the order,” says Fitzpatrick. “If it’s just a few things, anywhere from $2-5 is fine. If it’s a huge order, I would give more.” Also consider whether you live in an elevator building or a walk-up. A general consensus among people from FreshDirect and Trader Joe’s is that $1-2 per bag is appropriate, depending on size of order and actual manual labor involved with the delivery. 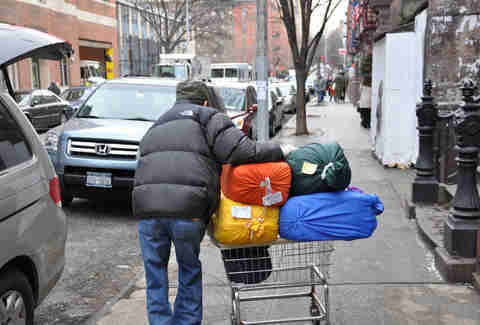 If you don’t live in a doorman building and actually communicate with your laundry delivery person, the consensus is they expect $3-5 depending on the size of the wash. “In most buildings with doormen, you don’t actually see the laundry person, but if you do interact with him/her, a $2 tip is fine,” says Fitzpatrick. NYC & Company recommends tipping 15-20% on the total bill, but waiters we spoke to seem to agree that 20% is the new standard. “Tips are where we make our money, which I’m sure everyone knows. If we’re doing our job well, we kind of expect that 20%. We have to live in New York, too,” says Sandra, a waitress with jobs in both Long Island City and Fort Greene. If we’re bottom-lining it, 20% would be the base for tipping, dropping less than that if service was substandard, and going over a bit if it was really stellar. Besides, 20% is way easier to calculate on the fly. But tipping in restaurants may soon be a thing of the past. Some of the city’s most popular restaurants have implemented a no-tipping model, arguing that it’s better for the customers, staff, and business overall. Danny Meyer’s been most vocal about the benefits of no-tipping, committing to putting it into practice at all of his restaurants. Craft, Eleven Madison Park, and newcomers Momofuku Nishi and Pasquale Jones have hopped on the trend too, among others. Lois, an all-tap wine bar in the East Village has eliminated tipping as well. 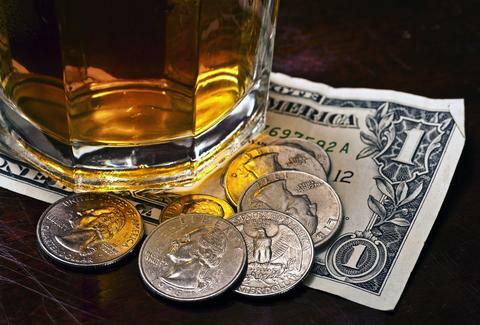 If you’re at a fancy lounge, versus a regular dive, it’s also expected to tip a little higher, as well. If you’re getting bottle service, 20% of the total is expected. 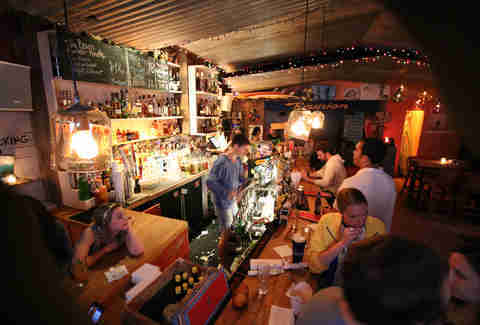 “If you’re sitting at the bar for hours drinking one drink, give $5, because you’re taking up space,” adds Fitzpatrick. If you live here, you’re probably not staying at a hotel. But when your parents visit you, they’ll want this info. 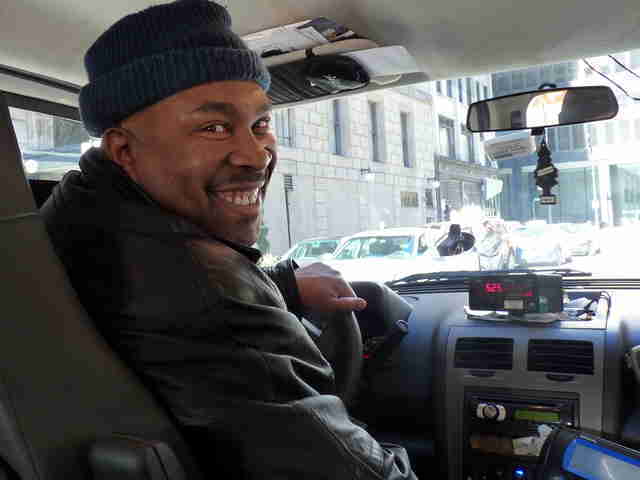 A doorman at a New York City hotel expects $1 for hailing a cab. Porters and bellhops expect $1 per bag. Fitzpatrick suggests $2 for the first bag and then $1 for each additional bag. How much you should tip your doorman depends on a number of factors: how often you ask them for things, how many units are in your building, how many years you've lived there... to make it easy, simply use TripleMint's clear-cut quiz, which will have you answer all of those questions and more to figure out the proper amount to tip your doorman. If you’re doing this, you’re definitely also carrying a foam Statue of Liberty crown in your purse. 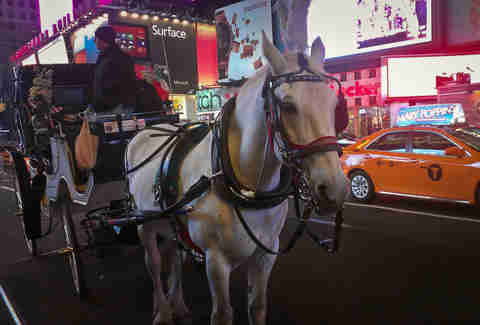 So if your trip to New York feels incomplete without that Carrie and The Russian moment, Central Park Tours says, “Tipping $10-$15 for a 20-minute ride, or $20-$25 for a 45-minute carriage ride is what is expected.” See you at Serendipity after! Meagan Drillinger is a contributing writer for Thrillist and usually hands over all extra cash in her wallet to avoid having to do fast math. Follow her on Twitter, Instagram, and Facebook at @drillinjourneys.